I wasn't always a birder, although anyone who knows me might tell you otherwise. My interest in biology started when I was a kid. Between watching Wild Kingdom on Saturday afternoons and spending most of every day of school break camping, fishing, or roaming the woods, biology was a natural choice for me. Northeast Alabama, where I grew up, is well known for its karst caves and freshwater aquatic invertebrates; and I was purely fascinated by the dynamics of salamander metamorphosis. It was no surprise to my parents when I informed them at the age of eight that I would be a wildlife biologist. I majored in marine biology and zoology at Humboldt State University in northern California under the direction of Dr. John Reiss. I didn't want to specialize, realizing that I had a great interest in both vertebrate development and intertidal ecology so I studied both! It was at Humboldt that I got hooked on birds and gained a love of the salt marsh and its terrifying complexity in nutrient dynamics. Shorebirds and seabirds were the first birds I learned and they remain firmly entrenched as an educational and career passion. Out of college, I worked for consulting firms on commercial projects that provided me with a sense of obligation to more fully understand anthropogenic effects upon wildlife populations. 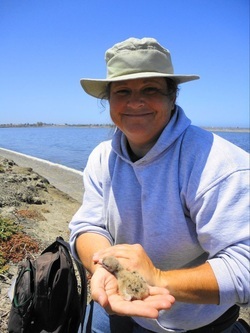 My first real avian research position was with Dr. John Takekawa at the USGS San Francisco Bay Estuary Field Station monitoring shorebird use of the Napa-Sonoma saltponds prior to tidal restoration. I became interested in the foraging ecology of waterbirds and waterbird-saltpond dynamics. It is no real wonder that I find myself back at a saltworks once again here in San Diego.